Coral Ridge and Seabridge are master-planned communities located next to Coral Creek Golf Course and Barbers Point Golf Course. These communities are build by Ewa Gentry and offer single family homes. Coral Ridge is a Gentry Homes single family community located next to the Coral Creek Golf Course. All of our Gentry homes are HERS (Home Energy Rating Score) tested and meet strict guidelines for energy ef ciency. Some of our energy saving features include open cell foam insulation in the walls and ceilings, a high performance 17 SEER air conditioning unit, dual pane LOW E windows, ef cient LED lighting package and a sleek display “NEST” programmable thermostat. These features and more work together to save energy and reduce the cost of homeownership. To keep up with technology, a conveniently centralized “media cabinet” is also included, which make connections effortless with CAT-5 wiring throughout and ber optic cable available in all living areas. Coral Ridge offers four different plans that range from 1,576 living square feet to 1,946 living square feet. In addition, all homes come with a 400+ square foot 2 car garage and lanai space. Prices start at the low $600,000 range. The Master Association fees are $35 per month. This project is on a wait list so please contact us so we can help you get on the list. SEAbridge by Gentry Homes offers 277, 3 and 4 bedroom homes that attract both transplants and local families buying a home for the first time. These homes aim to bridge the gap of apartment or attached condominium living to a more detached home lifestyle. 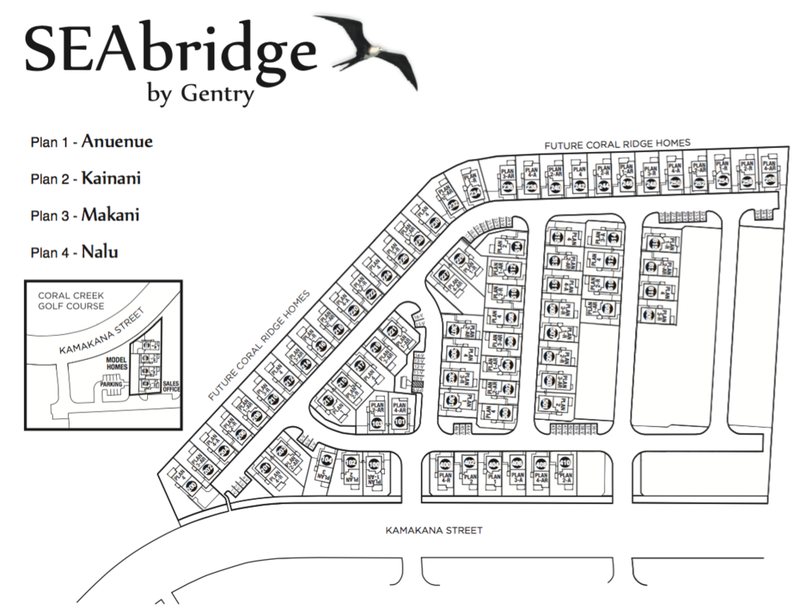 SEAbridge offers four different plans that range from 1,147 living square feet to 1,259 living square feet. In addition, all homes come with a 400+ square foot 2 car garageand lanai space. Prices start at the low $500,000 range. The maintenance and association fees are estimated around $400 per month. This project is on a lottery system so please contact us so we can help you enter the lottery.